Oh...no...why she didn't come to red carpet ??? probably she couldn't make it in time. The program should give more time for red carpet interview, instead, it was cut to stage live broadcast even though all audiences weren't seated yet. Shin Hye Sun said, "I started the ballet recently because of my work," and "I feel that my body and mind are playing separately." (She's so slim but good for ballerina role, can't wait to see her in the new drama. But we will not see the short hair again, right ?). So the sad news is Hae Sun didn’t walk the red carpet! Sung Hoon did. Is she even attending? Too sleepy to watch the whole show though, now when don’t even know she is there or not. Fingers crossed, she is there! She just finished presenting an award! Decked in a red dress!!! She looks so good in red too. Gorgeous and elegant! Shin Hye﻿﻿ Sun said, "I started the ballet recently because of my work," and "I feel that my body and mind are playing separately﻿.﻿"
This really made me LOL! It's gonna be difficult, first as a violinist then now a ballerina. But I guess she love such challenges. Can't wait seriously can't wait to see ballerina Yeonseo ! (She'﻿s so slim but good for ﻿ballerina role, can't wait to see her in the new drama. But we will n﻿﻿ot see the short hair again, right ﻿?). I was about to say... looks like her hair has gotten longer again! Full video link to celebrate. No more black or white dress, today she is RED Shin Hye SUN !!! @Ni Wen, yes , after I saw your post of Kim Bo-Mi practicing ballet, she looks so slim and determined for this role. So I'm so worried about SHS whether she will be able to lose weight and have sufficient ballet training to compete with her rival (in drama). I'm disappointed not to see Sung Hoon and Hye Sun taking photo together. He looks very handsome tonight. 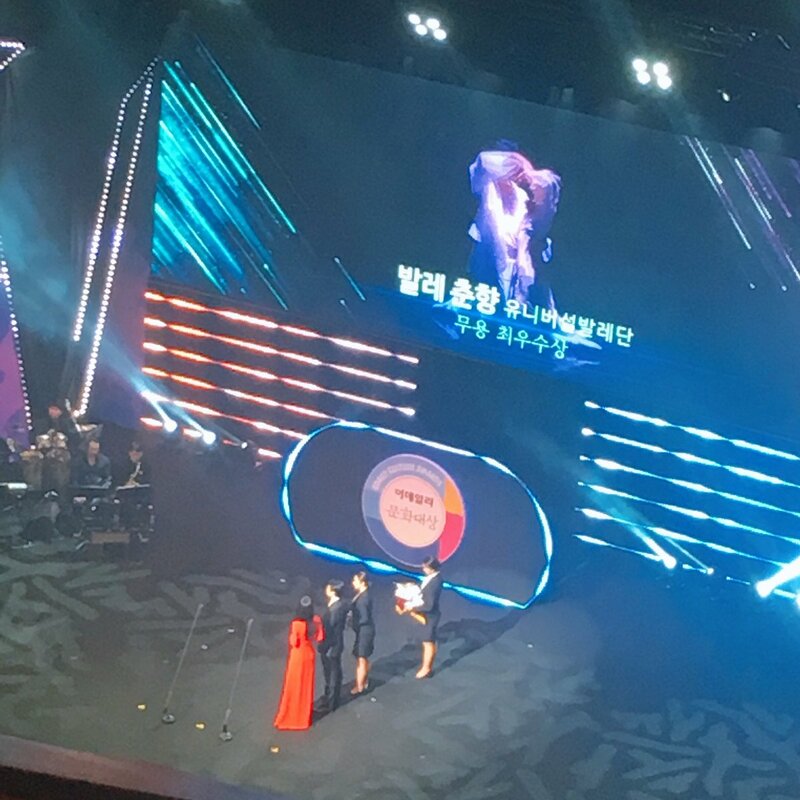 Lee Young-Eun who played as 'Woman in yellow dress and high heels' (Jennifer's sister-in-law) in '30 but 17' also came to present award today. @immorethant lol, you were right ... it seems like she was busy being a ballerina behind the scenes .... she does look tired or am I over reading her? But it even though a person can post a BTS pics or insta video? Pics of shoes at least?! Something!! Long hair really suits her, make her look graceful. Still wearing? I thought she removed? Her hair was slightly shorter in that latest Carlyn video. Yes I agree long hair suits her! I also feel she kinda looks a little tired... as compared to SBS Awards where she was beaming with energy. Hope to see her become an energy bunny again. Fighting Hyesun sshi! It’s airing in May but promotional videos and pics will start in April itself, no? So technically we have to deal with March only! She looks stunning in red and with long hair! Thanks for sharing chingus! But i can't see how she could lose more weight, she's already very thin. So many pages have been added since my last visit! You guys know how to stay busy even when it's quieter for Uri Baby. I have a lot to catch up but i will start first with my review for Hymn of Death. I finally watched it on Netflix and was surprised to enjoy it a lot more than i thought i would! The fan reviews weren't positive: i was told the acting even for SHS was wooden and the drama lacked soul and emotion.To be honest, the trailers seemed to confirm it. But while it felt indeed like an incomplete work, a drama that didn't reach its full potential, it still delivered a lot in term of character development and cinematography. I don't regret at all watching it and would have liked to see more of the story. Shim Deok! she's a very impressive heroine, who got it all: heart, intelligence, talent, independence of mind, loyalty and courage, a strong personality that she used to support her political views about freedom and progressive fight for a better place for women in society. Basically everything you want from an heroine. The best character that SHS has played since Eun soo! SHS's acting! she literally carried the drama alone at one point (her co-star was clearly not invested but more of it in the bad part). It took her one episode to fully own her character, but after that she shined with a strong sense of confidence: as usual she made the best of the script. She got to the tip Shim Deok's identity, and had a clear vision of her character's ordeal and emotions that she showed through a delicate, subtle and diverse range of expressions. She made relatable the conflicted emotions in which Shim Deok was locked: her desire to realize her dream, to follow her heart and her loyalty to her family, while the conflict could have looked too traditional to understand for a modern audience. Watching her look so mesmerizing in those superb outfits, i couldn't help but imagine her as one of Jane's Austen best heroines: Elisabeth Bennet, Elinor Dashwood, or Anne Elliott (my favourites). There's no hope for a korean adaptation but it would fit her very well, more than a sageuk. I truly think her acting style suits more the modern heroines. The costumes and sets: i'm not sure about the historical accuracy (i saw a post on tumblr where the production team was criticized for using props that didn't exist during the years in which the story took place) but the vibrant colors, consistency of the palette of colors, and attention to details fully worked to give the feeling of escapism in another period despite the limited budget. The cinematography was superb, almost on a film level. Be it by capturing the last drop of rain after a storm at night, or the devastated expression of Shim Deok's during her silent call in ep 3, i could feel that every shot had an intention and supported the way to tell this story. Visually, it was like watching a painting, an immersion in the details of the work of the artist to get the taste, feel and vibe of a period/time long gone. Lee Sang Yeob's cameo : i loved his appearance as Shim Deok's suitor because i feel like he had the right chemistry with SHS and really tried to convey the (failed) romantics feelings that his character had for Shim Deok. I wasn't completely convinced that he could have been such good spirit about her rejection. Maybe i'm reading too much in it but felt that somehow while he looked happy for her (and maybe relieved: he might have been in love with someone else just like she did since it wasn't clear if it was only his family's choice or his choice too to marry her), the scandal that came just after the cancellation of their engagement seemed completely staged (i don't understand why his family would have wanted her so much since she was very poor, maybe, for her fame? But wasn't her activity of singer something that was socially disregarded?). I'm pretty sure that the administrator working for the Japanese colonial authority and the man who lend her money were in cahoots to ternish her reputation and force her to do their will and her ex fiance (involuntarily) played a part in it though he gently warned her about the consequences for her. The end/ep3: i loved how the script explained their suicide and linked it to their family issues. It wasn't only about being separated, but also about not being able as individuals to make more sacrifices than they have already accepted. Their lives became suffocating and running away wasn't an option: the guilt would have overpowered Shim Deok. To leave behind her family suffering miserably because of their poverty and the harassment of the japanese occupant wasn't even thinkable for her. I think Woo Jin had already accepted to give up his father: his decision was made when he left home. Going abroad wouldn't have make much difference despite what his wife said. But living without Shim Deok didn't make sense for him while dying at her side was a guarantee to not suffer anymore. Lee Jong Suk was clearly miscast but it's not completely a problem of acting skills: it's true that he obviously lacked the subtlety, depth, and intensity required to portray a character who had long moments of inaction/contemplation, but it's mostly because of his lack of interest in Woo Jin. The character was reduced because of LJS's poor understanding of the script, to be a rich boy with pretentions/fantasy to be a writer, bored to death with his life. I never felt that i was watching an artist being unfairly repressed and prevented to express his voice/talent in a world not ready to accept his view, like the script tried to tell us. LJS lacked the passion required to convey to the audience Woo Jin's hopeless dilemma (with the exception of the scenes he confronted his father and looked finally alive!). His individual scenes seemed rather like a photoshoot where he was trying to look good. Being an ancient model was here an easy way out for him: he knew how to make make himself present on screen while avoiding to act. His scenes with SHS lacked chemistry: i never felt on his side the attraction. It's like he was playing opposite to his little sister and couldn't convince himself to see more in her. A situation that i can't explain logically because she put her heart in her character and was Shim Deok (and brilliant). The writing: I regret that we had to wait ep 3 to see Woo Jin and Shim Deok's motivations developped fully. I wish we spent less time during the 2 first episodes on their romance and more on developping their contrasting personalities and individual convictions. The real Shim Deok and Woo Jin, based on few articles i read, were people who had, before meeting, a hard time to find their place in society because their ideas weren't consensual/conventional for their time. They were clouded by the idea of suicide way before they met but the script romanticized too much their relationship at the expense of accuracy and realism. I'm not fan either of the way her family was presented: their obsession for money was pushed to a degree that made it excessive, unrealistic. Also how could she afford all those beautiful dresses while they could barely eat and she was spending all that she earnt in her family's expenses? The PD was at times so focused on making everything pretty that it ruined the moment: I mean look at the so called scene of torture of Woo Jin after he was arrested. Look too at the scenes on the boat at the end when they danced: Woo Jin and Shim Deok looked like Rose and Jack from the film Titanic! Not only it harmed the credibility of the plot while the story is true (! ), but it reduced them to be remembered only as tragic lovers. To sum up, 6 episodes would have been better to develop the story to its full potential and keeping it centered on Shim Deok/SHS while recasting the male lead would have helped too. But overall, it's a good drama and i'm satisfied to have finally watched a project that she did recently that i can praise! I’m surprised you mentioned fans reviews weren’t positive ... didn’t read them ... I always said, to me, this performance of Shin Hae Sun was such that if it was a longer series, she would have easily won a Daesang for it! So subtle, so expressive! I became a fan because of her performance in this. Those reviews are among the 1st ones i read when the drama aired on SBS. Few people on Dramabeans were negative too (i'm talking about comments written before the recaps). But on Tumblr and Twitter, international fans seemed to have enjoyed more the drama. She did a strong performance but it's hard to say that she could have deserved a Daesang if the drama went longer. I think the change that i mentioned about the writing would have been really necessary to make her performance really noticed. From what I read fans reviews of 'Hymn of Death' from many sources (twitter, IG, websites), I found most are positive and praised her acting as 'phenomenal' level. For some negative reviews I think it's only when the drama was first broadcast and people just saw only 1st episode (sometime I understand viewers have some expectation before watching drama and they need time to tune it). Later when the drama was finished and people can binge watch all 3 eps and saw the whole work, I found most reviews are positive even from Korean viewers. I think it's a win for SHS, she surely got more fans from this drama. I agree that this HoD drama is not quite complete or not reach its full potential. I think the only reason I want to blame is the budget. Personally I think PD-nim, director-nim, script writer-nim, SHS and LJS really wanted it to be a perfect drama, but they might got so little budget for this project. For SHS, she's the reason that I watched this drama over and over again, even it's so sad. She's perfect for this role. For her long hair, I read someone in DC inside said that she will do a shampoo or hair product CF (probably for Olive Young), but I still can't find any proof of that. So we just wait and see. Oh her performance was noticed! Lately I don’t see performances which desvere Grand Prize Awards! And her performance was pretty good! Oh wow I love this drawing. Really show how suffocating of Shim-deok's life. She’s doing a drama with LJH? At first, I think for this 'One and Only Love' , I will see only actor/actress just dress up in ballet suit and see only few scenes of ballet with face close-up shot or using stand-in for full-body shot. But seeing both SHS and Kim Bo-mi practicing hard, really makes me so excited and my expectation now is so high as 'Black Swan' level . Come on, if Natalie Portman can dance ballet, why can't our Shin Hye Sun ? However, I'm still worried about her as seeing she looks tired in yesterday's award, so please don't do it too much and get this same kind of agony (but at least 'One and Only Love' is a romantic fantasy, not psychological thriller). Ms Portman, who is hotly tipped for an Oscar for her portrayal of the desperately ambitious, perfectionist dancer, said: "There were some nights that I thought I literally was going to die." This article give some ideas on how hard the practice will be. (it may be not hard like this for SHS but I'm certain it's not easy). Note: Although Natalie Portman practiced ballet so hard for one and a half year and won the Oscar (with some controversies that a stand-in claimed that film used CG to superimposed Natalie's face to her body (link) ), she still got criticize from actual ballet dancers. Agreed. Duly noted on the first post on page 1, but can't change the name on the thread now. Thank you @jakey09. Apparently, Dan My Only Love has just started filming. Only thing is not sure if it's only others starting ahead of Hyesu﻿n﻿. Thanks @Ni Wen I reposted your stuff in the DoL thread with some comments. He did. That ceremony was quite underwhelming, and I guess we fell for the hype. It's hard to put on a great award ceremony, but this one was crazy how they don't even introduce the names of the nominees, just a 2-second flash each on the screen. I think I heard someone say the awards were $500 (and LoL the KFC coupons - so the winners can go enjoy fried chicken and beer afterwards). Yes, I'm afraid you're right. She has lost more weight and she did look tired. Enough to make me pray she's staying healthy. That coupled with her not posting much or making appearances does make you worry if she's enjoying herself or personally struggling at the moment. Oori Hae-Sun-ssi FIGHTING!!! @titania1000 !! So good to hear from you, and to read your long thoughtful post again. Yes. I agree with many of your points - looking back on 2018, I think this short 3 eps had a greater impact than 30b17 for me, personally - and visually it was just amazing to watch on a big screen - her nuanced expressions were at another level in the role, and with all its imperfections in the story and the production, the role was still tailor made for SHS. So I hope she does more work with great cinematography and big emotional range this year too - she belongs on big screens.